On April 17th 1995 Oasis played at the Southend Cliffs Pavillion in England. The gig was released in August 1995 on VHS, VCD in 1996 and on DVD in 2001. 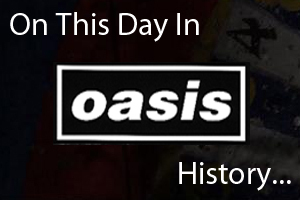 On April 17th 1995 Oasis appearance on 'The White Room' was broadcast on Channel 4. They played 'Acquiesce', 'It's Good To Be Free' and 'Talk Tonight' with Paul Weller. On April 17th 2000 Oasis released 'Who Feels Love?' as a single. The song reached number 4 on the Official UK Singles Chart. Watch the video for the song in the below.